Before you go any further, let’s just get one thing straight: this is “bread” in the sense that a bellini is a “fruit smoothie”, but eating bread for breakfast seems so much more reasonable than eating cake for breakfast and it IS baked in a loaf pan. This comes together really quickly, uses pretty basic pantry ingredients, and smells absolutely divine while it’s baking. Pair it with your favorite coffee for breakfast, or with a hot cup of tea for an afternoon snack and you’ll feel super decadent, even for a Tuesday. Of course, pair it with a bellini and you basically have toast and a fruit smoothie – super healthy breakfast! 1. Preheat your oven to 350. Whisk the flour, baking powder, and salt. Stir in the oil and eggs until well combined. Mix in the sugar and milk. 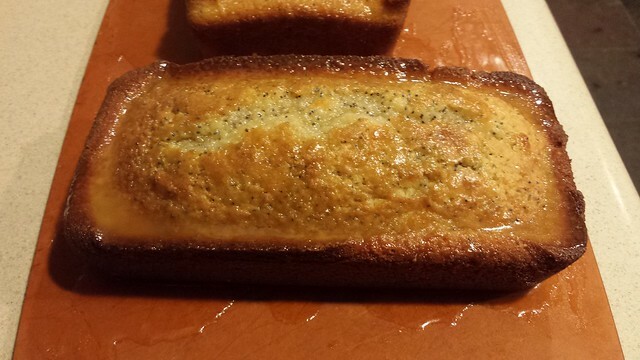 Fold in the poppy seeds, extracts, and butter. The batter should be a thin, not at all dough-like. 2. Divide the batter into two greased loaf pans. Bake for 50 minutes, until the tops begin to crust. 3. As soon as you remove the bread from the oven, stir the glaze ingredients together in a small saucepan. Cook over high heat until the sugar melts (I brought mine to a boil, which was fine), stirring constantly. When the glaze has cooled a bit, remove the bread from the pans and drizzle the glaze on top, stopping occasionally to let it soak in. I recommend doing this on a plate or over foil because it will drip over the sides. Allow the bread to cool before serving.